Sherlock cast member and co-creator, Mark Gatiss, wants to make sure the US audience tunes in for the New Year’s Day Victorian era special episode, Sherlock: The Abominable Bride. His alter-ego, Mycroft Holmes, may well believe we Yanks need special assistance finding the show on local PBS stations and PBS.org, so he has made a video explaining how to do so. Sherlock: The Abominable Bride, starring Benedict Cumberbatch and Martin Freeman, airs Friday, January 1, 2016, at 9:00pm ET/PT, with an encore broadcast on Sunday, January 10, at 10:00pm ET/PT. The special will also stream for a limited time on PBS.org/Masterpiece. What do you think? 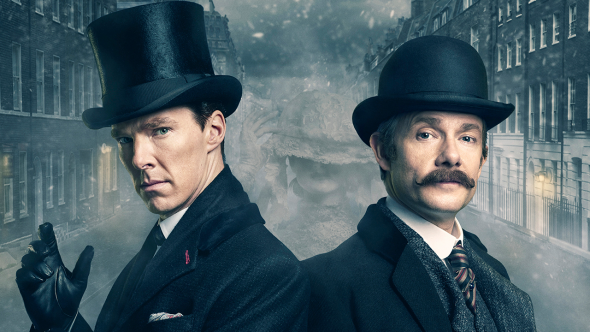 Will you be tuning in for the Sherlock: The Abominable Bride Victorian special? Do you like that the Sherlock TV series is generally set in contemporary London, or would you have preferred it as a period mystery?